Earlier this week, the Daily News pointed to the intersection of Essex and Delancey Streets as one of the deadliest in the city. Where bicycle accidents are concerned, it isn’t the only dangerous street crossing on the Lower East Side. 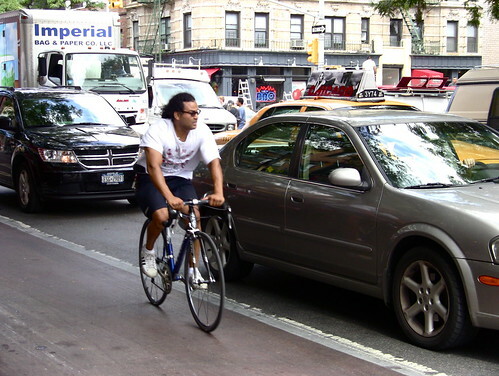 In fact, data shows that the neighborhood boasts many of the intersections most prone to bicycle crashes. The Local obtained records from the New York City Department of Transportation of cycling accidents in 2008 and 2009, the most recent years available. The records reported all intersections where four or more cycling accidents occurred in 2008, and three or more in 2009. Of the 33 intersections on the list, nine are on the Lower East Side (three of those nine are on Houston Street, the border of the East Village). The data reported a total of 45 crashes at those intersections. Midtown was the second most sketchy neighborhood with 38 crashes across its accident-prone intersections.